Welcome to H3 Maths » Blog Archive » Counting less than 4 comes naturally! 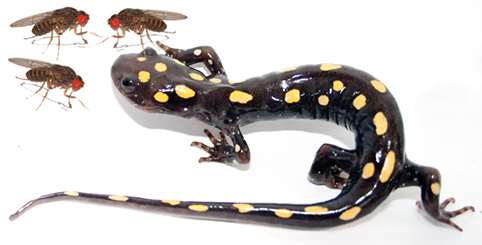 “Salamanders, given a choice between tubes containing two fruitflies or three, lunge at the tube of three1. This hints that the ability to differentiate between small numbers of objects may have evolved much earlier than scientists had thought. Primates can spot the greater of two quantities smaller than four, without any training. Babies choose the bowl with more cookies; monkeys go for the bucket with more slices of apple. The surprise, says Claudia Uller, of Kingston University, who carried out the study, was that the amphibians “failed in the same way that babies and monkeys do” – more than three objects confuses them. “There is a limit on the number of objects that can be tracked at one time,” explains Alan Leslie, who works on human brain development at Rutgers University in Piscataway, New Jersey. The portion of the brain that focuses attention cannot, it seems, deal with more than four objects.” Full article here. by James posted under Uncategorized | Comments Off on Counting less than 4 comes naturally!